(Gustavia, St Barths)- Sailing in just about every condition the Caribbean can throw at the fleet, from uncharacteristic light airs on the first day to line squalls punctuated by brilliant, dramatic sunshine on the second day to a tempest in a teapot for the last two days on Friday & the Saturday finale, it would be fair to say the sailors in the fifth edition of Les Voiles de St. Barths simply “loved” racing in “the emerald of Caribbean sailing” regattas (or would it be the “champagne” or “rose’” edition? )— far too many superlatives to consider for a fun, sophisticated event that deserves such accolades and more. Les Voiles has continued to grow every year, both in entry numbers and shoreside activities. It’s no wonder- the sights, sounds, aquamarine waters, epic weather, spectacular beaches, majestic mountain cliffs, exotic French hosts and awesome shoreside festivities are the ultimate “sailing cocktail” found anywhere in the world. This year’s seventy boat fleet from across the world were simply enthralled with the entire scene, teams came from the Caribbean (St. Barth, St. Maarten, Anguilla, Martinique, Antigua, BVI, Puerto Rico) as well as the U.S., Canada, the U.K., The Netherlands, France, Spain, Malta, Sweden, Australia and Ireland. The seven J/Teams that participated excelled in the variable conditions, demonstrating yet again the amazing capability for “J” designs to sail in just about anything thrown at them across the weather spectrum- flat waters, light winds to massive breaking seas in 20-28 kts on the nose. Leading the charge in Spinnaker Racing 1 Class was Jim Madden’s champion crew aboard the J/125 STARK RAVING MAD, winning a hard fought class of “dragsters” on the last day. The J/111 J-BOSS had a complete French crew, with owner Eddy Chalano and fellow J/111 owner of LE JOUET (Stéphane Blanchard) splitting the crew to form a potent team to take second in Spinnaker Racing 3. The Spinnaker Racing 4 Class saw the J/109 POCKET ROCKET take class honors with David Cullen’s Irish crew doing a “wee bit” of celebrating after the regatta! Note- the magnums of Veuve Clicquot champagne given to EVERY boat that finished the last race on the last day was emblematic of the “class act” this regatta has become over the past five years! Day 1 Report- On the first day, Gustavia’s Quai General de Gaulle was abuzz with competitors. With nine classes separated into four starts, the fleet was sent off in a light southeasterly breeze of about 8-10 knots, sailing courses of 21nm. The light breeze made for a long day for most, though no one was complaining given the otherwise ideal conditions. With the breeze forecast to build throughout the week, all boats proved, ultimately, they would have a chance to revel in their best conditions. Day 2 Report- The Weather Gods had promised more breeze for Day 2 and it came in a steady line of squalls moving south to north across the island, presenting challenging conditions for competitors and the Race Committee alike. After a general recall, the Maxi and Spinnaker Zero classes took off on a 17 nautical mile course along the southern coast of St. Barth, only to disappear into a driving rain and building breeze halfway up the first beat as they got raked by the first squall. With visibility on the start line greatly diminished, the Race Committee held off for about 40 minutes, and then with persistence and a weather break before the next approaching squall, they managed to send off Spinnaker 1-2-3 classes. Drag Racing was taking place in Spinnaker 1 class. The five-boat Spinnaker 1 class had great depth of talent, and included Peter Harrison’s Jolt 2 (GBR) with Volvo veteran Campbell Field at the wheel; past Les Voiles class winner Lazy Dog, an M32, with Puerto Rico’s Sergio Sagramoso steering; and Stark Raving Mad IV (Newport Beach, Calif.), a J/125 with Tony Rey, past America’s Cup sailor and Olympic coach, serving as tactician. Jim Madden who owns Stark Raving Mad IV, won his class at last month’s Heineken Regatta. An experienced racer, he has had a succession of Stark Raving Mad boats, including a J/160, J/145, Reichel/Pugh 66, and Swan 60. Madden likes to race with old friends and good sailors, most of them from California, with a few East Coasters, including Rey, mixed in. Festivities ashore included the gala soiree and auction to benefit The Brain and Spine Institute- ICM at the Eden Rock on Baie St. Jean and the famous (sometimes “infamous”) Crew Party on Shell Beach with live entertainment and fireworks. Seemingly half the regatta showed up at the “Baz”, an evening night club at the easternmost end of Gustavia Harbour, home of the famous Clarke Cooke House “Candy Store” sushi chefs David Ray once recruited many blue moons ago! Day 3 Report- After enjoying the regatta’s traditional lay day on Thursday at Nikki Beach (does anyone remember them serving “rose’ wine”? ), which gave crews a chance to indulge in the French island’s onshore charms, it was time to get back out onto the race course. Many regattas no longer feature such a break in the racing, but Les Voiles has maintained a five-day format (four days of racing with a mid-regatta break) since its inception five years ago, and it has proven to be a draw. In fact, more than 400 of the thousand or so sailors racing gathered at Nikki Beach on Baie Saint Jean for lunch and some organized team sports, including water polo, stand-up paddle-board races and petanque matches. The morning dawned with a much fresher breeze than Wednesday and sailors prepared for a forecasted 18-25 knot southeasterly. With the race course set off the north side of the island, most of the fleet readied by tucking in reefs and setting small #4 jibs while they jockeyed for positions in the starting area. With the breeze building, the Race Committee postponed racing, sending the fleet back to shore; however, shortly after noon, signals ashore indicated a 1:30 p.m. start for eight of the nine classes. With the wind at a steady 20-23 knots, gusting to 28 kts, the fleet enjoyed a 16 nautical mile course that took them to the north end where large ocean swells rolled through. Day 4 Report- With several classes still up for grabs, crews going into the final day of racing were eager to get on the race course and improve their scores. The conditions remained fresh, with a 22–25 kt (gusting to 29 kts) southeasterly producing an impressive 6-12 ft swell on the island’s windward side. Les Voiles de St. Barth Race Committee, led by Race Director Luc Poupon, carefully chose race courses to fit the conditions, sending the Spinnaker Racing 1 and 2 classes on a 22 nautical mile course and Spinnaker Racing 3 and 4 on a 16 nm course. As spectators watched from a sculpted rock plateau 500 feet above the pristine beach of Colombier, the sailing conditions on the northern most point of St. Barths seemed epic: strong, fairly steady wind, with flat water at the starting area and the first rounding mark. At the next mark, however, the fleet began its beat around the island’s northern end into the ginormous ocean swell. A two-knot current running counter to the prevailing wind produced 6-12 ft seas that, while uncomfortable upwind, made for a rollicking ride off the breeze. The change in conditions from the lighter wind of the regatta’s first two days (Tuesday & Wednesday) to the 20-plus knots on the latter two days (Friday and Saturday) affected several classes with boats that favored one range or the other. As for the French J/111 J-BOSS sailed by Eddy Chalono’s crew and Stéphane Blanchard’s LE JOUET crew, it was an event that will be remembered for a long time. Blanchard commented, “Back from St Barthélemy today. Too many photos and videos of memories that prevents me to do everything right away. Such beautiful water, magnificent winds 10-30 kts, with four days of racing with one race per day. Every race counts and OCS’s are heavily taxed, there is no need to return for line! In our category CSA 3 with much larger boats, we had as a main rival the Grand Soleil 43 (just like the one in Quiberon Bay). Race 1 and 2 were run in the light-medium winds and we end up scoring two seconds on handicap to the GS43. In the third race, it was a sustained 25 kts of breeze and with not many tactics involved, we finish second overall but fourth on handicap. We finally have our revenge at the end of the race 4, because after tacking upwind in a steady wind at 25 kts gusting to 30 kts, we return to Gustavia harbor with a great downwind ‘sleigh-ride’ that I think will live long in the memory of our crew members (half J-BOSS/ half-LeJOUET). We had consistent speed under spinnaker around 14-15 kts with several long planes in excess of 20 kts and a peak at 21.6 kts!! Second overall, hugs for all on arrival at the finish line, sprinkled Veuve Clicquot champagne everywhere (it was given to us at the finish line), have closed masterfully this beautiful event. More to follow.” Thanks to Stephane Blanchard for his contribution- see more here. A special note- there was an extraordinary team of life-long “J” sailors and college champions aboard the 56 footer WHITE RHINO in Class 2. Skipper-in-charge was Steve Cucchiaro (M.I.T.) sailing with a cast of characters, including Jack Slattery (Boston University), Stu Johnstone (Tufts), Cam Lewis (Univ. Rhode Island), and Brian Thomas/ Mark Laura (Univ. Washington)- in total this gang have amassed 11 College All-American awards, one College Sailor of the Year award, two J/105 North American Championships, at least one each of J/24 World, North American and West Coast Championships, two Finn Gold Cup World Championships, the first Trophee Jules Verne Record holder (breaking the famous 80 days record around the world), a second in the 470 Olympic Trials 1980, and many other awards too numerous to mention. With that deeply talented team, they managed a second place after losing a tie-break on identical records with their arch-rival AFFINITY (each boat had two 1sts and two 2nds!). The winner in that epic battle? Jack’s brother Bob Slattery (Boston Univ.) sailing as tactician (yet another College All-American)! Small world. (Key West, Florida Keys)- Classes and sailors from across the country and around the world already have Quantum Key West 2015 on their winter calendars. Boats ranging in size from 23 to 72 feet will compete in the waters off America's southernmost city during the 28th edition of Key West Race Week, scheduled for January 18-23. Boats big and small are already making plans for North America's premiere winter event. The ever-popular J/70 class may see this year's 60-boat turnout grow to 70-80 according to class sources. Kathy Parks, owner of SUNDOG, shares the enthusiasm of many other J/70 owners... "The Division 2 race committee gave us another great Quantum Key West Regatta. I love the 5 days of racing, which we rarely see anywhere else and we love the energy at the panels, party and awards." Expect another heavy dose of J/Boats next January with as many as five J/111's in PHRF 1 and the J/88s expecting to make some noise in PHRF 2. The Event Organizer will be featuring PHRF courses that include reaching legs to augment the traditional windward / leeward courses. Other classes expected back with their highly competitive racing include the J/80's and there is talk of a J/105 Key West revival following a brief hiatus. This popular one design class featured some of the most competitive racing in Key West for a number of years and would be a welcome addition to the 2015 fleet. "Where else would you want to be on the third week of January?" asked multiple world champion Cam Appleton. "I've done my share of race weeks over the years in any number of classes and the boat you race on really doesn't matter - the conditions are always terrific, the race committee work and event management are unsurpassed, and the competition is always full on. When I think of sailing in the U.S. I think about Key West Race Week." (Deneysville, South Africa)- The J/22 World Championships are about to take place for the first time in class history in South Africa from April 26 to May 3rd. The South African J/22 class is hosting the event at the Vaal Dam situated in the Northern Free State Province. The Deneysville Aquatic Club, in the small village of Deneysville on the Free State side of the dam, will be the privileged co-host the social events. The regatta centre and base for the fleet will be at Manten Marina, also situated in the village of Deneysville. The amazing facilities at this marina will provide all the necessary amenities for docking of all participating J/22’s. All the clubs, bed and breakfast accommodations and residents have promised to make this a memorable event for the sailors, families and friends in the regatta. The host club- Deneysville A.C.- renowned for its hospitality and is pulling out all the stops to co-host the event. The full-time catering facilities in the club house will provide the sailors plenty of food and beverage throughout the event. They also offer campsite accommodation to all the competitors on the club grounds. Alternatively, excellent camping facilities are also offered at Lake Deneysville Yacht Club with much larger camping space. The turn-out for the event has been nothing if not enormous for this corner of the world- forty-one teams are sailing with representatives from all over South Africa, the Cayman Islands and Germany. Many familiar names from the South African J/22 class are sailing, those who’ve been in the top five in past events like the provincial and national championships, such as LAUGH A MINUTE (John Bruckmann), MAJIC (Jessica Lenz), US’N’J (Graham Baker), AMTEC RACING (Marcello Marica and Amtec’s Mike Hayton), CELL C (Richard Weiderhold), SHAMBLES (Shellee Nel), ULLMAN SAILS (Craig Millar), and Donovan Kruger on HAKAHANA. (La Trinite-sur-Mer, France)- It was yet another fun, challenging SPI Ouest France Intermarche Regatta that was held from April 17th to 21st on Quiberon Bay. The 300+ boats participating were not disappointed with the sunny breezy weather, certainly a far cry from last year’s event that saw some teams suffer hypothermia in the cold, stormy conditions. The marquee fleet was again the enormous International J/80 class with eighty-nine boats on the starting line. After an exhausting twelve races over the four days, the winner was ultimately determined on the outcome of the last race, new energetic talent confronting and overcoming a long-time class veteran. By sailing an extraordinarily consistent series, Morgan Lagraviere on SAFRAN clearly stepped up his game and by never finishing worse than 10th, managed to win the regatta by one point after posting a 4th in the last race. Sailing a tough series was Sylvain Pellissier’s veteran crew on VOILERIE ALL PURPOSE, taking second with 62 pts total after having to count a last race 21st, much to their disappointment. In fact, for all intents and purposes, it looked like Pellisier’s crew had won the regatta going into the last race after posting a 1-2 scoreline in races #10 and #11- such is racing in a big fleet. Third behind them was another class up-and-comer, Matthieu Salomon sailing CHARIOT PLUS- VANNES UTILITAIRES with 80 pts net. Rounding out the top five were Maxime Mesnil on COPILOTES- NORMANDY ELITE TEAM in 4th and Gael Jaffrezic on SAILING EXPERIENCE in 5th. Top Spanish team was Inigo Jauregui’s GOLD SAILING in 6th. The J/70s enjoyed equally fun racing over the four days, also managing to sail twelve races in all! However, unlike the 80’s, the 70’s saw a dominant performance put in by Luc Sambron sailing HEMON-CAMUS. Sambron’s team are former top J/80 sailors and have taken quickly to the J/70 performance envelope. By taking eight 1sts and three 3rds (tossing a 3rd!) for a total of 15 pts, it was clear they were the runaway winner. However, giving them a strong run for the roses in the last five races was T. Mellano’s LE HAVRE NAUTIQUE. Mellano’s crew had troubles in races 4, 5 & 6 but sailed a 2-2-1-1-2 to race back up the ladder to capture second overall for a total of 47 pts. Third in class was F. Charles’s crew on SUPER U LANMEUR- CABINET ABALLEA A (quite the sponsor name, eh?) with 51 pts. The balance of the top five was Jan Bergh’s Swedish KSSS YC sailing team on MOVEIT and Jm. Gosset’s LOCATION SPORT BOAT in 4th & 5th, respectively. In IRC handicap world, two of the J/122s in IRC 1 class put in good performances. The highlight of MADE IN LOVE’s (Jm. Patier) performance over the seven race series was a 1-3 in the last two races to capture fourth overall. SPARKLING CHARTER (F. Lognonne) had a consistent series with finishes predominantly in the top ten to take ninth in class. It was the classic, beautifully restored J/35 KNIGHT BUILD LIMITED, sailed by J. Charmers from Weymouth Sailing Club in Great Britain, that took top honors for J/Teams with a sixth in IRC 2 class, notably winning the last race to celebrate with a wee bit of champagne and a few “good on ya’s” after cracking the top ten only once before with a third in race four. Sailing in IRC 4-A were twin duos of J/97s and J/92s’s all of which sailed against most of the top French IRC boats in the category. Topping the charts for J sailors was the J/97 MISPIKEL V sailed by B. Fagart to a 4th in class. Just behind them was the J/92s DR JEKYLL skippered by T Bidon taking a 9th, followed by the J/97 PICKWICK (P. Nouzille) in 10th and the other J/92s SABOT (M. Demazure) in 16th. (Cowes, Isle of Wight, England)- Entries are now open for the J/111 World Championship 2014 which will be hosted by the Royal Yacht Squadron in Cowes, UK, from Tuesday 19th August to Sunday 24th August 2014. Racing will commence on Wednesday 20th of August and twelve races are scheduled over five days. A strong international entry is expected for both of these key J/111 regattas. The J/111 European Championship will be raced on the same waters as the J/111 World Championship thereby providing visiting teams the opportunity to gain valuable insight and experience sailing on the challenging waters of the Solent, the spiritual home of British yacht racing. An entry of between 20 to 25 boats is expected for the World Championship and expressions of interest from teams keen to compete at this inaugural J/111 World Championship have been received from France, the Netherlands, Belgium, Sweden, Norway, South Africa, Hong Kong and the USA. The UK J/111 fleet is already enormously excited about the event and the teams are all firmly focussed on results. Dedicated coaching and training weekends are already underway in the UK and whilst the teamwork on board each boat is improving and the camaraderie between the teams is building, the competition in the UK J/111 fleet is hotter than ever. With so many international teams planning to visit British shores to compete at the J/111 World Championship it is especially fitting that this first world championship for the J/111 Class is to be hosted by the Royal Yacht Squadron, the most prestigious yacht club in the United Kingdom. In an auspicious and functional symmetry, the 2015 J/111 World Championship will be hosted in the USA by the New York Yacht Club in Newport, Rhode Island before returning to the Royal Yacht Squadron in 2016. The J/111 International Class Associated is proud and privileged to announce that this two year rotation of the J/111 World Championship between the premier yacht clubs of the UK and the USA, the Royal Yacht Squadron and the New York Yacht Club, has been established for the foreseeable future, enabling J/111 owners to make long-term regatta plans based on top flight competition and consistent race management of the highest standard. The J/111 class welcomes aboard the regatta sponsors- North Sails UK (www.uk.northsails.com), Hudson Wight Performance Sailwear (www.hudsonwight.com), Grapefruit Graphics (www.grapefruitgraphics.co.uk), Wight Vodka (www.wightvodka.com), and Spinlock (www.spinlock.co.uk). (San Diego, CA)- Come on out to the beautiful San Diego Yacht Club for their renowned spring event, Yachting Cup, and race with J/World from April 30th to May 4th. This year marks the 41st year of San Diego Yacht Club's signature regatta, the Yachting Cup. This premiere regatta brings together competitive fleet and one-design racing at multiple venues in San Diego. This is an excellent warm up for the racing season, so come visit us in beautiful San Diego, then go home ready to take on all comers! J/World, the Performance Sailing School, will be offering sailors the opportunity to come play (and learn) during this special event. We will be hosting a three day racing clinic prior to the regatta, which will include boat-handling, sail handling, strategy, tactics, rules, etc. etc... all the elements which will contribute to a successful regatta. Then it is test time... and we have the ultimate test: a real regatta! Each of our J/80s will have teams of three students plus one coach per boat. Everyone aboard will rotate through all the positions while getting the positive insights of one of our renowned J World instructors. Availability is limited, so reserve your space early ($400 deposit)! Call 800-910-1101 or visit J/World San Diego website. Stale? Spice Up Your Sailing! (San Francisco, CA)- Expanding a usual-suspects match-race competition to include a women's division and a youth division, with shorter races, more races, and many a "Hey, I've heard your name, nice to meet you" is a good thing! What to do when a grand event outlives its prime, but mustn't go away? It's an obvious call to "think outside the box," but there's no formula for that, is there? Since 1967, two leading clubs on San Francisco Bay, The San Francisco Yacht Club and St. Francis Yacht Club, have maintained an annual match race rivalry. First sailed in 46-foot CCA boats and later in either sizable IOR boats or Santa Cruz sleds, with a few shots at Farr 40s, the San Francisco Cup match eventually followed the almost-inevitable path to J-built sprit boats. Except for a few J/120 matches, the event settled into J/105s borrowed out of Fleet One. Everything was fine. For a while. But, after that while, repetition turned into A Problem. Now, it's necessary to say that different people may have different views, and your correspondent was the merde-disturber-in-chief in 2014, so this is not an independent report. But it was time for a change. Absent opportunities to return to the glory days of custom fiftyish-footers, what to do? One way to look at that is to ask, what is the best thing going in the moment? CCA boats had their moment. IOR boats. Santa Cruz sleds. And J/105s are not going away. But the St. Francis Yacht Club, in company with the St. Francis Sailing Foundation, in recent years undertook to build a fleet of J/22s kept primarily for match racing and team racing. What about keeping the Usual Suspects division of J/105s and leavening it with a Women's division and a Youth division from each club in J/22s? Get different parts of each club engaged with other elements of their own club, and then mix it up with the other club. It worked. And it could work anywhere, in whatever context. In this case, it was about fulfilling the mission statement of the San Francisco Cup, which begins: "The purpose of this trophy is to promote good fellowship between the two yacht clubs." The 2014 event proved that more is more. Youth, ladies, gunslingers, we had'em all. The J/105 match featured SFYC Commodore Bill Melbostad in #40 Blackhawk with three Perkins brothers by his side (you may have heard of them) vs. StFYC (what a difference a "t" makes) Staff Commodore Peter Stoneberg in #196, Risk. Stoneberg's armaments included Olympians Craig Healy and Russ Silvestri. All around, not a bad deal with two top ten-ranked women skippers and crack crews, Katie Maxim for SFYC and Nicole Breault for StFYC, where the balance went to StFYC. Adding women's and youth divisions reset the pulse of the event. Under an agreement that the winner would be the first club to accumulate 11 points, St. Francis YC took the cup by a one-point margin in Race #21 by a scant 8 seconds. StFYC 11, SFYC 10. It can't get much closer. Skippering the deciding win was StFYC/Stanford's Antoine Screve (bronze and silver at ISAF Youth Worlds) racing against SFYC's Jack Barton, 2013 Sears Cup champion, who brought along his Sears Cup crew of brother Sam Barton, Corey Lynch, and Sammy Shea. Where are we now? People know people that they didn't know before. People were included who were excluded before. It's called being a club. It's called being a community, and it could work in many a context. With accumulated points determining the winner, it's doesn't matter how many divisions race, because an even number of divisions does not risk a tie. Why not a fourth division with high schoolers crewing for an adult skipper? Now that's a mentoring opportunity, eh? A masters division? One race where each side draws lots in a public setting, and all the other skippers for that club crew for the skipper who wins the draw? There are any number of ways to play this, and mixing it up is the name of the game, provided the real name of the game is fun. I know it's an impossible standard to meet, 365 days a year, but we're here for such a little while, and, when we can, why not make life a special occasion? Preparing to hand off the San Francisco Cup to the other side of the bay, the man who had done his part as skipper by winning SFYC's J/105 division, Commodore Bill Melbostad, declared, "I think we're onto something." Thank you for the contribution from Kimball Livingston- St Francis YC. (Rye, New York)- On Long Island Sound, the racing season gets underway with American Yacht Club’s Spring Series, where J/Boats are well represented for two weekends of racing- April 26-27 and May 3-4. There are so many J/Teams, it amounts to a “J/Fest Spring LIS Championships”. Seventy-eight boats are participating, including fifty-seven J/Teams (73% of the entire fleet)! One Design fleets are strong for the J/44’s (7 boats), J/105’s, J/109’s and, especially, the 14-boat J/70 fleet (it’s their AYC Spring Series debut). The new J/88 will debut in PHRF competition with a PHRF 87 handicap, and the J/29, J/92, J/111, J/122 and J/133 round out the scratch sheet. (San Francisco, CA)- Last weekend, April 12-13, the St. Francis Yacht Club hosted the first of two West Coast (Area GHJL) qualifiers for the US Match Racing Championship, also known as the Prince of Wales Bowl (POW). The POW dates back to 1931 when the Bowl was donated by Prince Edward Albert to promote small boat sailing among junior yachtsmen. In 1975, the event morphed into what we know now as the US Match Racing Championship. Selected from among numerous applicants, the eight skippers included Newport Harbor Yacht Club members Payson Infelise and Jack Thompson, Royal Canadian Yacht Club member Landon Gardner, and St. Francis Yacht Club members Jackson Benvenutti, Nicole Breault, Russ Silvestri, Bruce Stone, and Shawn Bennett (past winner of the overall championship). The boats were splashed on Friday to give the teams a chance to practice on the J-22’s used for the event. StFYC did a great job making sure the boats were in top condition for the regatta. Saturday dawned with a typical overcast sky, but then the fog burned off and revealed great conditions for a regatta. The westerly breeze filled in with 8 to 12 knots, and the course was set just north of Crissy Field and the StFYC. As is typical in match racing, the races were two lap affairs, with a downwind finish. PRO Bartz Schneider indicated the goal of the two days was to get two round robins completed if possible. A building ebb tide made the races a bit longer than anticipated, but also made the racing very close, as any advantage gained at the start or during the weather legs could be quickly erased as soon as the boats turned downwind. This made for some close racing and lots of action at the bottom mark rounding, with the on-the-water umpires getting quite a workout. At the end of the first round robin, it was Team Silvestri with a 7-0 record, followed by Team Bennett and Team Infelise with an equal 5-2 record. The race committee decided to squeeze in the start of the second round robin, and one more race was run. It was pretty obvious that there were some tired teams on the water at this point, with some questionable boat handling, lots of flags, and general mayhem. Team Silvestri managed to squeak out another victory at the finish with some heavy sans-pole hand-guyed spinnaker reaching and lots of yelling to finish the day with an 8-0 record. Many interesting stories were exchanged at the debrief following racing, including a few truthful ones, but Chief Umpire Kim Kymlicka and his team made sure that the record was set straight. On Saturday evening, Bruce Stone and Nicole Breault hosted a party at their Marina District home, a short walk from the StFYC, with festive socks the uniform of the evening. Country and western recording star Phil Claypool, a St. Francis club member, provided great entertainment, and libations continued well into the evening. On Sunday morning, the fog was absent, and so was the wind. An at-the-dock postponement was welcomed by the tired crews. When the breeze did fill in, it was the typical westerly at 8-10 knots, with another building ebb tide guaranteeing close racing with penalties burned at the last possible minute, boats overlapped at the finish line, and other hand-to-hand combat between competitors keeping the umpires and race committee busy. When the dust settled, the final tally was Team Silvestri with a 12-2 record, Team Infelise at 11-3, and Team Bennett with a 10-4 record. Silvestri advances to the US Match-Racing Finals, also being held at the St Francis, on October 3-5. (Newport Beach, CA)- The annual Newport to Ensenada Yacht Race is a 125nm dash from the starting line off the Newport Beach breakwater down to Ensenada, Mexico. It has been billed as the largest yacht race in the world, with an emphasis on camaraderie as well as competition. It has attracted fun-seeking novices and celebrities from around the world. People such as movie producer Milton Bren, well-known actors Buddy Ebsen and Humphrey Bogart, Walter Cronkite- anchorman for the CBS Evening News, comedienne Vicki Lawrence and Pulitzer Prize-winning cartoonist Paul Conrad have raced alongside world-class skippers like America’s Cup winners Dennis Conner and Bill Ficker and multiple one-design World Champion- Dave Ullman. With more than 20 classes, the race includes an enormous variety of boats ranging from ultra-light maxi-yachts to the non-spinnaker classes and even 60-70 foot ORMA and MOD trimarans capable of 40kts-plus speeds. While the race has seen entries north of 600 boats in the past, this year’s event will have 155 boats competing for dozens of trophies that are awarded for just about every imaginable performance. The weather promises to be epic, with winds starting in the 7-12 kts range for the early starts and then building into the high teens or low 20s by evening. The latest weather model runs (NAM, GFS, ECMWF) have moved the breeze build-up earlier by several hours so maybe that trend will continue and there will be lots of pressure earlier than currently anticipated. As it stands the fastest boats should finish around 8pm if they sail the best course possible. The breeze is forecast to stay up all night and even the slowest boats should be in by mid-morning. The sea state could be challenging for unprepared crews, but many boats will revel in the conditions. J/122 T.K.O. skippered by owner John Raymont. The only known offshore keelboat one-design class sailing in the N2E is PHRF C, a fleet of six J/120s. The daunting part about this class is that every single boat has won some event in the J/120s in recent times. The boats that are participating read like a “who’s who” in this West Coast class, including ADIOS (Peter Bretschger), FEE EVENT (Chuck Wert), J-ALMIGHTY (Mike Hatch), JIM (John Snook/ Ron Masterson), POLE DANCER (Terri & Tom Manok), and SHENANIGANS (Gary Winton). In the nine boat PHRF D Class is one of the more renowned West Coast “J” teams, Seth Hall’s beautiful navy blue J/124 MARISOL. Yes, this is the same boat that has supported the youth/ junior yacht club programs on their weekly “beer can” races, where an entire crew of kids under 18 race the boat every week. How cool is that!? The N2E marks the offshore debut of the J/88 in the twelve boat PHRF E Division. Called CRAZY EIGHTS, her new owner is the famous nationally syndicated radio talk-show host- Dr. Laura Schlessinger- from Santa Barbara, California. Her experienced offshore team will be up against two of the best J/109s on the West Coast, John Shulze’s LINSTAR and PATRIOT (sailed by the duo of Jon Turner & Don Albrecht). Two veteran J/35s will be competing for line and handicap honors in the seven boat PHRF F class, including BACKDRAFT skippered by Steve Worchester and RIVAL helmed by Brian McKenna. Finally, the seven boat PHRF G class will also see another “J” match-race scenario with two J/105s in the hunt for some silver; they are Tom Bollay’s ARMIDA and Juan Lois’s ROCINANTE. Featuring the HOT New J/88 and the Cool J/70! (Annapolis, MD)- North Point Yacht Sales will be participating in the Annapolis Spring Boat Show this weekend (April 26-27) and will have a J/88 and a J/70 on display. This is a regional event held annually in the spring at the City Docks in downtown Annapolis, the center of the sailing universe in Chesapeake Bay. For more show information, please be sure to visit the US Boat Show site. The following weekend (May 2-3-4), the Sperry Top-Sider Annapolis NOOD Regatta, hosted by Sailing World magazine and the Annapolis Yacht Club will be taking place— in short, it’s an “all weekend boat show” for J/70s and others in the “J/stable”. For more Annapolis NOOD sailing information. (Annapolis, MD)- The North Sails team is looking forward to the Sperry Top-Sider Annapolis NOOD Regatta from May 2-4 at the Annapolis Yacht Club. North U Regattas Services will be on the water during the Annapolis NOOD taking photos & video followed by post-race debriefs at Annapolis YC. J/97 KNOCKABOUT Scores Two “Golds”! (Sydney, Australia)- For the second season in a row the Sydney Harbour based J/97 KNOCKABOUT has won the Australian Measurement System (AMS) pointscore of the Sydney Amateur Sailing Club Super 30 Gold Cup. The Super 30 division is a mixed fleet of high performance keelboats of approximately 30ft length, some of them highly modified and is hotly contested. The race series included a wide variety of weather from drifters to howling gales. In the final tally KNOCKABOUT dropped a 4th and a 6th to come home with an impressive score line of five 1sts, three 2nds and two 3rds. (Les Sables d’Olonne)- Originally created by 3 students from the French Business School EDHEC in 1968, the EDHEC Sailing Cup is now organized by 50 students and has become the leading student sporting event in Europe. Older than the Vendée Globe or the Volvo Ocean Race, the EDHEC Sailing Cup has always been a leader in the student top-level regattas. This year, the largest student regatta in the world comes back for its 46th edition in the mythic Port Olona, Les Sables d’Olonne, on the French Atlantic coast, from April 25 to May 3, 2014. Since its creation, the organization has been trying to promote sailing beyond the limits of the yachting world: the Land Trophy, the Sand trophy, and the Air Trophy, have been created to enable our sailor participants’ friends to join them in this adventure. This year again, the EDHEC Committee are welcoming sailors from all over the world to participate alongside the anticipated 3,000 students representing 22 countries. All will brave the Atlantic Ocean and are, hopefully, up the challenge of a 180-boat-fleet competition in Port Olona! The USA will be the most represented foreign country with five teams with most of them sailing in the chartered J/80s. It will be the third participation for University of Chicago, with first time teams from Drexel University, Tufts (2 teams) and Georgetown. Canada will have two teams: University of Laval and HEC Montréal. The crew from HEC Lausanne in Switzerland are the defending champions, last year winning the 100% Student and the International Ranking. “This year, the goal is to keep the two titles,” said Valentin Bovey, former skipper and now tactician of the crew. 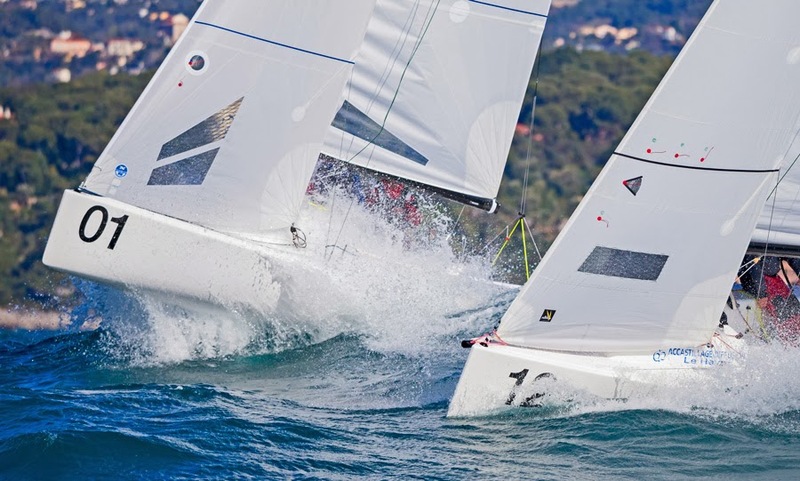 (Alassio, Italy)- During the International Offshore Week, a classic Spring event that starts off the summer sailing season, the first of the Italian J/70 Circuit regattas took place. The interest has been high for J/70s in Italy and the fleet is having a lot of fun for many of them who were competing for the first time. In the first regatta off Allasio, it was a closely fought race with Carlo Alberini the winner and Beppe Zavanone taking second overall. The second regatta of J/70 Italian Circuit will be organized at YC San Remo from 24-27 April. Many J/70s are already present practicing for the weekend regatta. The regatta expects teams from Germany, Switzerland, Slovenia and Monaco On 24th April, J/Boats Italy is hosting a “J/70 day” for all sailors interested in discovering more about the boat. (Warsash, England)- It was a busy time for Warsash Sailing Club on 12th/13th April with racing on both days for the opening of the Brooks Macdonald Warsash Spring Championship and the fifth Sunday of the Spring Series. As the weather became warmer, entry numbers have increased so that some 140 boats were out to enjoy the full schedule of racing. During the two days, the race officers ran over 50 separate races – a challenging but rewarding weekend all round. For Black Group, the south-westerly breeze started light but built by the end of the afternoon to a brisk 17 knots. Four races were scheduled and completed, largely using windward/leeward courses. In 2013, Warsash Sailing Club decided to open the Spring Championship to all IRC handicap classes. Although entries were modest for the smaller boat classes last year, IRC3 and IRC4 entered excellent fleets this time. In IRC 3, Diamond Jem (J/109 - Robert Stiles) finished the day with a two point lead. Iain MacKinnon’s Tigh Soluis II headed three of the four races for the J/109s with Jubilee (Tony Dickin) taking Race 1. After a slow start, Duncan Mcdonald’s J/111 team SHMOKIN JOE took two wins as did Louise Makin & Chris Jones’s JOURNEYMAKER 11. The White Group committee boat set up station in what might be regarded as their usual spot near Meon buoy close to the entrance of Southampton Water. The weather did not turn out as forecast with a shifty breeze reaching 20 knots at times. The stronger wind caused some equipment failure- the J/80 Juicy finished flying their mainsail from the head and clew only when the tack and bolt rope gave way. Nonetheless, four races were completed. It was a clean sweep for Ian Atkins, out for the first time in the J/70 class, with Boats.com. In the J/80s Aqua-J (Patrick Liardet) and Betty (Jon Powell) each took two wins. For Black Group, Sunday’s wind started in the north and went light before switching eventually to the west, then south-west at 10/12 knots. Two races were planned for each class and the committee boat anchored near Flying Fish buoy. A 10 mile course was set for IRC1 and IRC2 with shorter courses for the remaining classes. Boats in IRC1 pushed their start, with many over the line early. Several collided with each other and the committee boat. After a general recall, the restart, subject to the “Z flag”, meant an extra penalty for being early and this time the class got away. There were individual recalls for several classes but all boats returned to start correctly. By the time IRC3 got underway, IRC2 were coming downwind close to the line. One of the many temporary wind shifts meant that for a couple of classes the first leg became biased with little tacking to the windward mark at Wilson Covers. This was where IRC4 joined the parade, having started earlier from a separate line. Most skippers went for a white sail reach to the spreader mark at Hill Head buoy, though a few sailed high hoping to use their kites. After that all the spinnakers went up, followed by a game of tactics – whether to gybe and stay out of the tide or go straight to Sunsail. The majority stayed on the bank but there was more wind in the main channel, where some made significant gains. Aiming to complete two races, the start sequence for IRC1 began as IRC3 was crossing the finish, so a certain amount of dodging was necessary. Courses involved a couple of windward/leeward legs then a long tactical downwind leg against the tide when all the boats hugged the Lee-on-Solent side before crossing south to North Ryde Middle. The breeze picked up and backed on the way across. There was then another tide versus wind decision before the finish just west of Bart’s Bash. Black Group saw the J/111 teams experience rather topsy-turvy results for many boats. Leading the series is JOURNEYMAKER 11 with a 1-3-4-1-1-1 for 11 pts, with a comfortable 7.5 pt margin. Second is Cornel Riklin’s JITTERBUG with a 4-2-2-3-2.5-5 for 18.5 pt. Two points back is Mcdonald’s SHMOKIN JOE with an 8-1-1-2-6-2 tally for 20 pts. Fourth is David & Kirsty Apthorp’s J-DREAM and fifth is Andrew Christy & Chris Body’s ICARUS. J/109s are having quite a battle for the top five. The two leaders are just four points apart, Tony Dickin’s JUBILEE in first with 11 pts and Iain Mackinnon’s TIGHT SOLIUS II in second with 15 pts. The battle for third is virtually a three-way tie with Tor Mclaren’s INSPARA in third with 26 pts, Roger Phillips’s DESIGNSTAR 2 in fourth with 26 pts and David Mcgough’s JUST SO in fifth with 29 pts. White Group experienced shifty conditions too with the breeze moving through 110 degrees during the day and ranging between 10 and 15 knots. The first race had to be abandoned for all classes after one lap but with some nifty relaying of courses, all three races were completed. CRO Peter Knight felt competitors had coped admirably well at the starts given the wind against tide situation, most boats were on the line every time with no need for general recalls. Ian Atkins’ run of success in the J/70s was halted by Django (Malcolm and Tristan Jaques) in two races. There was close racing in the J/80s and a dead heat between Betty (Jon Powell) and Boysterous (Ali Hall) in the first race, each scoring 1.5 points, with Juicy (Allan Higgs) only 24 seconds adrift in third place. Jasmine (Douglas Neville-Jones) came to the fore in Race 2 and Rock and Roll (Gillian Ross) in Race 3. “If you didn’t return to the dock with a smile on your face it’s time you quit sailing and take up horse riding! It simply does not get much better than the two days of racing that showed up for this year’s Puget Sound Spring Regatta, hosted by Corinthian Yacht Club of Seattle. Fifty-five boats made it out April 12/13 for two of the most stellar days of the year for sailing in the Pacific Northwest. Fifty five boats split up on two different courses with 4 One Design and 4 PHRF classes. Up on the North Course, set just North of Meadow Point, they had the fast PHRF class with ratings from -21 to 36, a one design Farr 30 class with 6 local boats, a 9 boat PHRF class with ratings from 57 on up to 87 and a burgeoning J/105 class with 9, count em, 9 local boats on the line. Down on the South course, set off the Shilshole Bay Marina, there was the always active Melges 24 fleet with 8 boats, a PHRF J/70 & J/80 class, an 8 boat PHRF class with ratings from 114 to 129 and 5 boat San Juan 24 fleet rounding out the racers. The forecast wasn’t great for wind Saturday, but it wasn’t bad. Thank God, once again, the foreguessers had it all messed up and what was supposed to be 10 knots of breeze turned into 12 to 16 with some gusts recorded at 18 to 20! The sun was out, the wind was blowing, the pink skins were thronged on Bikini Beach and the race committee rolled off race after race in the solid Northerly breeze. As the day went on, the flooding current combined with the strong Northerly to create some river-like conditions in the middle of the sound. Way far over on the right corner you could find some current relief on the South course, way, way far over. Boats had to over stand the mark by what felt like 50 boat lengths before tacking over to layline. The driver then lined up the mark on the leach of the jib, yes the leach, and then powered along to weather as they crab walked over the mark some half a mile away. Still just barely getting around the mark after the biggest over stand anyone had ever seen. But if you made it around cleanly it actually paid off to hit the far right corner! Up on the North course there was no relief from the current to be had and the safe move became coming in on port approach to the weather mark. Safe on laying the mark and not hitting it, but not safe on starboard traffic. Boat after boat didn’t lay the mark on both courses and many were seen spinning their circle just below the weather pin. Consider yourself in the minority if you didn’t hit a weather mark at PSSR, the current was that strong. 5 to 6 races Saturday for everyone on both courses and as the procession began the long reach into the marina, the smiles were seen all across the fleet. Even though, the stoke level was high in the clubhouse on Saturday night, even with the sore muscles and bruises from a 6 race day in 12 to 16 knots of breeze. Sunday dawned looking way better than the forecast 0 to 5 knots out of the North and as the first horns blared away on the committee boats it actually built up into the 10 to 12 knot range! Class 4, the J/105s had a close battle going between Delerium & Jaded and with 7 other boats pointing at their transoms they each need to reach down and keep sailing hard. Down on South course, the Sail Northwest Crew on the J/70 Just Listed had an equal hold on the J/70-J/80 class with Crazy Ivan solidly in 2nd and DaSpencer & Periodot battling it out for 3rd place. So with winds way better than forecast, once again the sausage course racing commenced and with less current than Saturday the way far corners didn’t play into the game as much on the South course and the current and wind lanes were shifting all over the Sound. For a while the far left worked well to get to weather, then it shifted to right middle for just as long. The sailors really had to pay attention to the wave action and the color of the water to find the strongest winds with the least adverse current. Those who did this the best could make up for the worst start in the history of sailing and round the weather mark in front of their competition. Peaking out at 12 knots the winds eventually settled in to the 8 knot range with the lightest winds at the end of the day for the final races thrown off just before the time limit ran out on racing for another amazing day at PSSR. There is never any wind in Seattle, and it always rains – remember this while your finishing this article and looking at Jan Anderson’s amazingly sharp and colorful pictures. It’s too bad we have to live here and deal with these conditions, somehow we make it through. After another 5 to 6 races Sunday. That big one design class, the 9 local J/105s, was once again sailed away with by the fast crew aboard Jerry Diercks Delirium. 10 points behind them, but just three points in front of the third place Jaded, was Erik Kristen’s well sailed Jubilee. It’s great to see the resurgence in this fleet – a perfect PNW platform. Gorgeous J/Fest West On the Bay! EL OCASO & BAD GIRL Sail To St Thomas Gold! J/Sailors Win Etchells 22 Nationals! J/105 Sailing Drones- Wave of the Future? !